Reading the Fantastic Four comics from the start. Here’s issue #409, and we’re still Hyperstorm-ing it up with Hyperstorm. 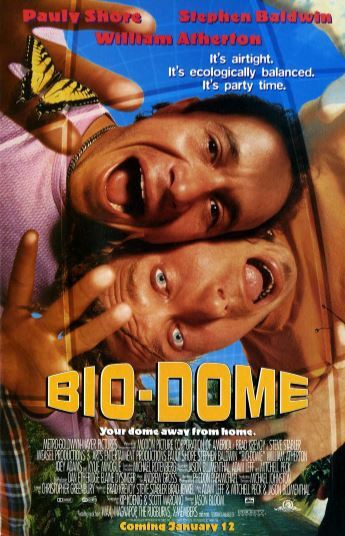 When Reed and Dr. Doom died, they didn’t really die. Godlike supervillain Hyperstorm transported them to a robot-filled alternate reality where he held them captive. The FF — along with guest stars Lyja, Namor and Nathaniel Richards — have arrived in this world for a rescue. This issue begins in the middle of that fighting, with Hyperstorm not even fazed by the heroes’ attacks. Sue pleads with Reed to get into Hyperstorm’s lab inside his nearby tower, in the hopes that Reed can speed-invent a weapon to stop Hyperstorm. 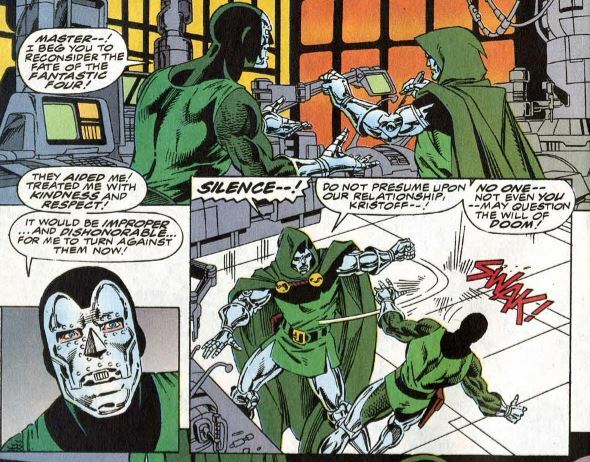 Inside the aforementioned tower, Dr. Doom and Kristoff are building a new version of the device Doom once used to steal the Silver Surfer’s power. Although Kristoff has seemingly betrayed the FF to return to Doom, he asks Doom the spare the FF because they aided in the rescue. Doom says he will allow the FF to live, after he has become the master of all the known universe. 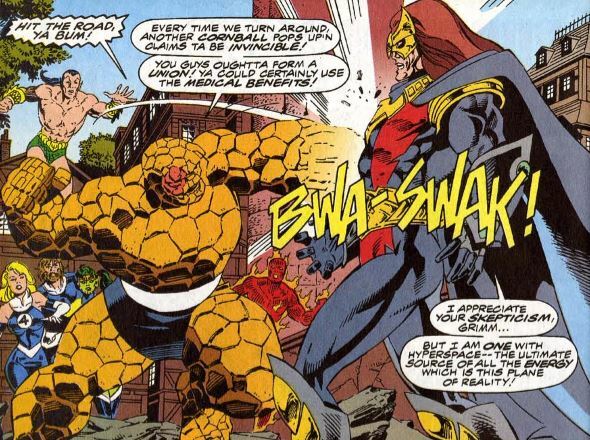 Kristoff asks again for Doom to reconsider the FF, after the FF included him as one of their own. Doom smacks Kristoff in the face, saying Kristoff in not Doom’s heir, but merely a failsafe. There are several pages of the FF trying and failing to attack Hyperstorm, with him easily swatting him back. Reed wants to take leadership of the team back from Sue, but Nathaniel pleads with him to get to the tower and work on the weapon. Back in the tower, Zarrko the Tomorrow Man wakes up, after having been mind-controlled by Dr. Doom last issue. He encounters Kristoff in a hallway, and he falls to his knees begging for forgiveness. Back to the fight, Sue uses her force fields in a way that they vibrate, which finally has an effect on Hyperstorm, pushing him back. Hyperstorm, then, puts Sue on edge by hinting that she and him share a mysterious bond. Hyperstorm is then zapped by an energy bolt rom the tower, which knocks him to the ground. He realizes that Dr. Doom is trying to steal his power, so he flies to the tower. 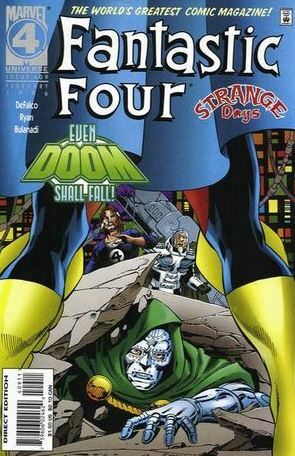 Reed and Nathaniel make it to the lab, to find Doom stealing Hyperstorm’s power. Reed decides that the Doom is the lesser of two evils and moves to help Doom. 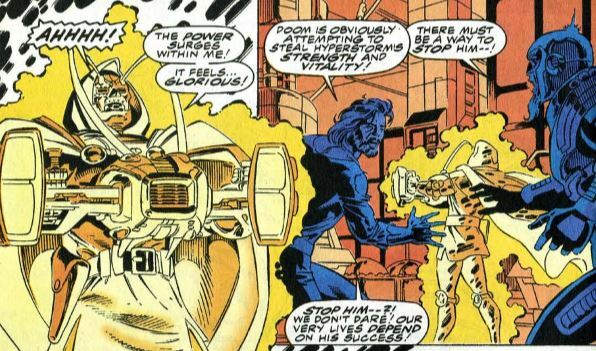 Doom thinks Reed is trying to trick him, and refuses. 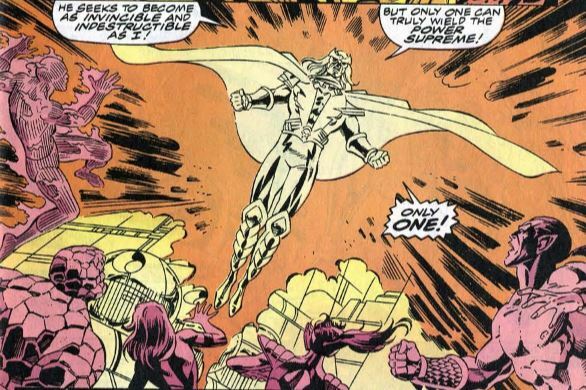 Hyperstorm shows up and blasts Doom, taking back his power. Hyperstorm raises his hands to punish Reed and Doom, when Kristoff and Zarrko, in another room, fire up Zarrko’s time actuator. Doom disappears in mid-speech. 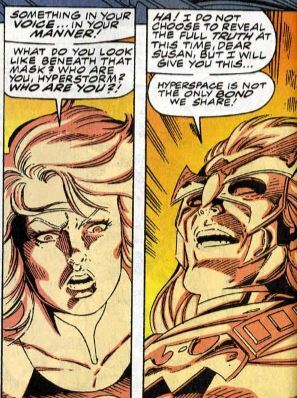 Hyperstorm, in his omniscience, already knows that Kristoff and Zarrko teleported Doom back to Latveria in the present. Hyperstorm let him go, confident that Doom is defeated. Zarrko time-travels himself out of there, and the rest of the FF join Reed and Nathaniel in the lab. Ben wants to fight some more, but instead Hyperstorm heals the scars on Ben’s face, saying that every time Ben sees his reflection from now on, he’ll be reminded of Hyperstorm. Then, somewhat abruptly, Hyperstorm teleports all the heroes back to Four Freedoms Plaza in the present. He tells them to always remember that he can seek them out and destroy them whenever he wishes. Johnny demands answers from Nathaniel about who Hyperstorm really is. But cuts off Nathaniel before he can answer, saying he’s lost the FF’s trust. Then Ben decides it’s time for a celebration, now that the original Fantastic Four are reunited. But it’s not that happy of a reunion, as the heroes reflect on everything they’ve been through recently, and whether it can ever be the same again. Unstable molecule: Reed’s running theme in this issue is feeling inadequate next to Sue’s newfound leadership qualities. The issue ends with him questioning his own self confidence. 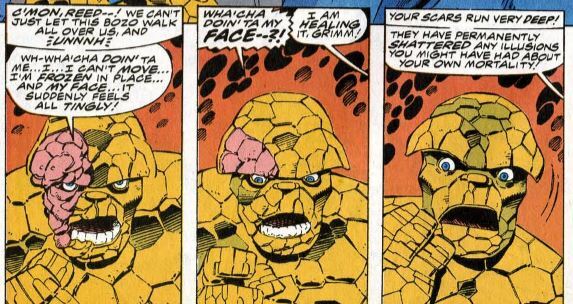 Clobberin’ time: Just like that, the scars on Ben’s face are healed. Shall we take bets on how rarely they’ll be referenced after this? Flame on: Johnny fires “molten blasts” at “nova level” at Hyperstorm, suggesting that he’s developing his powers in new ways. Fantastic fifth wheel: Ant-Man’s daughter Cassie sees Kristoff in his Dr. Doom armor for the first time, and she decided she no longer has a crush on him — much to Ant-Man’s relief. Although Kristoff appears to side with Dr. Doom in this issue, even teleporting back home to Latveria, he is still with the Fantastic Four when they’re reunited at HQ at the end. 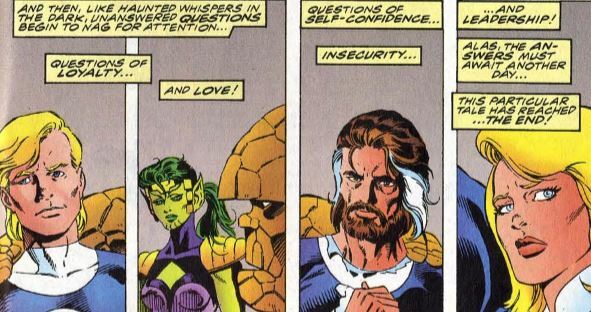 The Alicia problem: This issue spends a whole page setting up a Lyja/Johnny/Ben love triangle, as Ben is developing feelings for Lyja, but can tell she still wants to be with Johnny. Trivia time: Hyperstorm will return in just a few issues, when we’ll learn just who is and what his deal is. I’ve done a little reading ahead, and a lot of these subplots are going to keep subplotting for the next eight issues. That’s when writer Tom DeFalco will take off and the series will go in a whole new direction. Dr. Doom’s eyes are green in this issue, whereas they are usually brown. The Marvel Wiki also states they are brown. I guess we can surmise that the influence of Hyperstorm temporarily changed Doom’s eye color for some reason. Fantastic or frightful? Hyperstorm is supposed to be the greatest of all threats, and he’s so powerful that no one can even touch him. Is there a villain equivalent of a “Mary Sue”? (Scary Sue, maybe?) The fight ends with the villain just teleporting everyone back home where everything is back to normal, which comes off as a writer totally phoning one in. Next: The soapiest of operas.